Super Sharp, 8 Inch Blade With Holes And A Coating To Prevent Sticking. This powerful tool has a specially designed blade that virtually eliminates sticking. It will allow anyone to chop and slice with ease thanks to the advanced blade, and lightweight construction. The razor sharp edge is perfect for portioning sushi, but it works well on just about any other food too. Superior quality steel is forged into an eight inch blade, and then sharped to create a straight edge that is incredibly dangerous. The metal is then enhanced with ten holes to reduce friction, and a non-stick coating to make it glide through food. Cut soft cheese without it clinging, chop sushi without it sticking, or quickly slice through chicken and beef prior to cooking. The stick-proof coating allows you to glide effortlessly through any number of foods, but it also makes clean up a snap. Unlike other options with metal that allows pieces to glue in place, this one ensures that every spec washes off with ease. Bring speed and precision to your food prep, and power through fish, fruit, vegetables and other stuff with incredible accuracy. With an ergonomic handle, professional design, and dishwasher safe materials, this sushi knife would make the perfect addition to any kitchen. Sharp Blade. Made from top quality stainless steel, and finished off with a razor sharp edge. Easily glide through raw fish and other foods without effort. Non-Stick Coating. The entire metal surface is coated with a stick-proof material to aid in cutting and clean up. Avoid clinging and smashing. Quickly wash without effort. Added Holes. Ten holes line the cutting edge to further reduce friction and improve performance. Quickly glide through any food without resistance. Comfortable. Lightweight construction and an ergonomically designed handle make this tool easy to use. Grip for long periods without strain or fatigue. Versatile. Perfect for portioning rolls without flattening them, but also ideal as an all purpose tool for chopping carrots, or slicing tomatoes. Advanced Rocker Blade. With a rounded shape towards the point, this knife offers increased power with less effort required, and makes mincing a breeze. With high placement of the handle, fingers easily clear cutting boards as you chop. 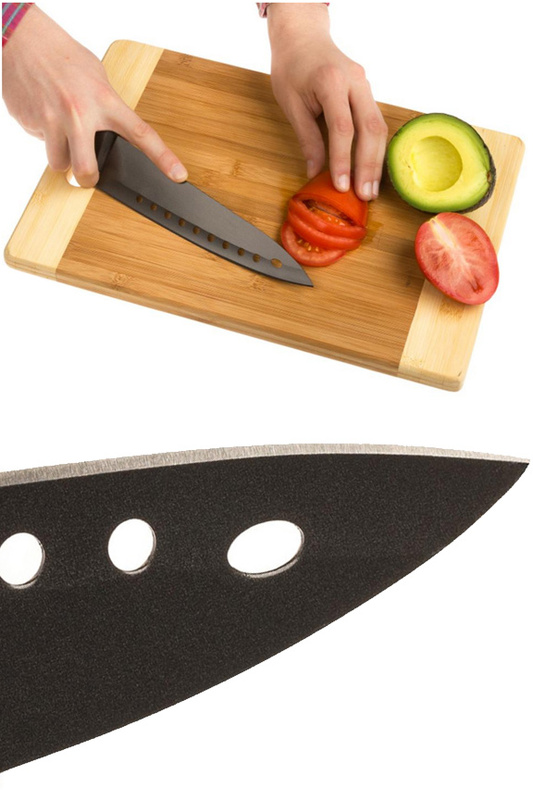 If you're already set up for making sushi and just want the cutting tool, then order away. If would also like a fast and easy way to prepare this healthy food, then check out our sushi making set. 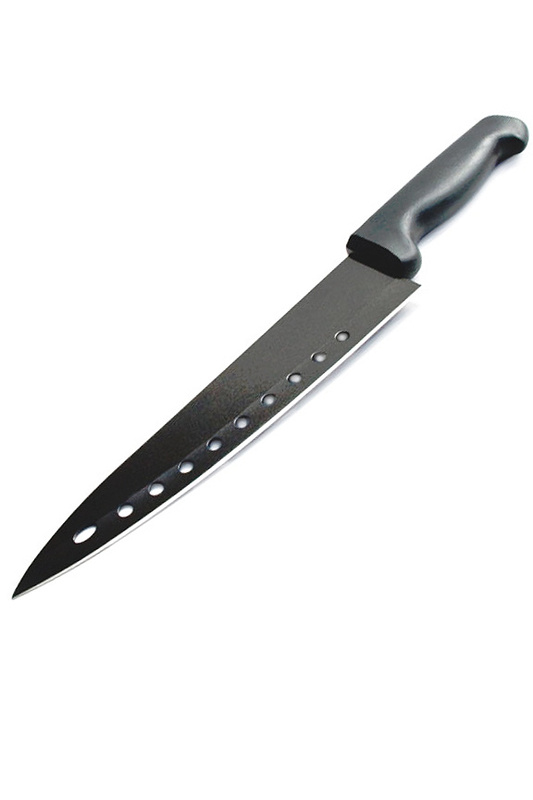 It comes with molds to create many different kinds, and this knife is added for free as part of the set. The already thin blade is made even lighter due to the added holes down the length. This makes it remarkably easy to handle, but the cut outs do more than just reduce the weight. Because there is less surface area involved, any food will naturally have a smaller area to cling to. When you combine this with the black coating that already prevents sticking, you have a tool that can slip through any food quickly without hesitating or mutilating in any way. The friction reduction and lack of suction makes notoriously difficult foods easy to work with, and allows you to work frustration free. Rice won't stick, tough meats won't give trouble, and softer rolls won't flatten as you try to cut them. Thanks to the advanced blade, and lightweight materials you will be able to maneuver easily, and cut food without fatigue. Stop settling for less than perfect meals due to inferior tools, but don't run out and spend tons of money either. This affordable alternative provides a ridiculously sharp edge that is long lasting and precise. It easily glides through raw meats, hard vegetables or soft cheeses thanks to the advanced design and quality construction. Restaurant quality tools are usually expensive, but this one offers loads of cutting power at a fraction of the cost. Get it to improve the look of your sushi rolls, then use it everyday for other slicing and chopping jobs. It will quickly become your go-to knife any time you prepare food in your kitchen. Overall Dimensions 13.25" x 1.8"
Blade Dimensions 8" x 1.8"
Dishwasher Safe Yes. Hand washing is recommended for maximum longevity. Specially designed to make cutting easy. 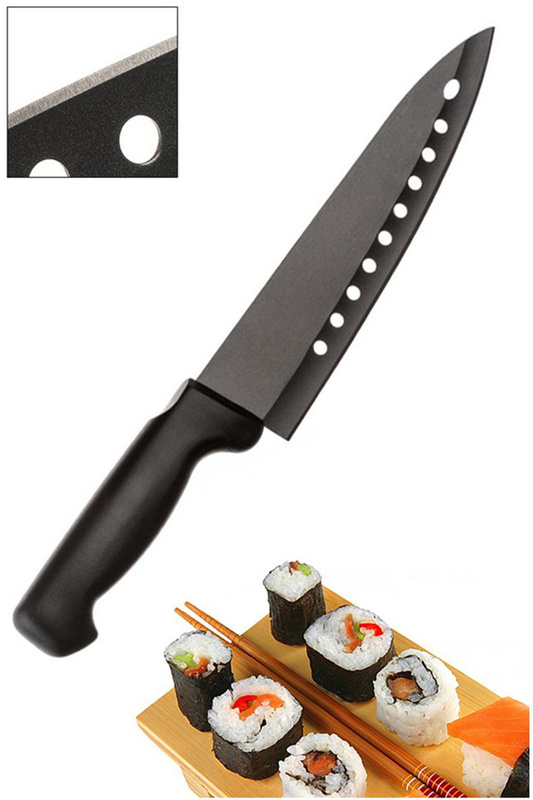 Perfect for slicing sushi or anything else that usually sticks to your blade. Order Yours Today. This is the best & sharpest knife I have ever owned. It is practically the only knife I use. I have given this as a gift that has been thoroughly appreciated by everyone that has received it. I am ordering it yet again for gifts for Christmas. Try it you won't believe how great this knife is. The knives arrived quickly and are great! This knife worked perfectly the first week of use, but by the 2nd week it started to full. Still looking for the right knife. Exactly what I ordered and fast. I have received this knife with the Sushi Maker. Apparently , this is the best knife I have ever had ( and believe me i have 50) ONE WORD - THE BEST KNIFE EVER!!!!!!!!! Best knife ever! I can slice through a loaf of soft bread without killing the bread. works great for sushi too. This knife is awesome cuts sushi rolls perfectly with no tearing and the teflon coating makes nothing stick to the blade, it's super sharp better than I ever expected!Also your shipping is super fast!